The ruins of the ancient Mayan empire: elaborate temples steeped in human sacrifice, still standing, amidst the decayed trappings of a once-glorious civilization. Colonnaded structures, wide streets and grand forums rise organically from the insatiable forest. Where Mexicos ruins attract the spotlight, Guatemalas remain less visited but no less exhilarating. 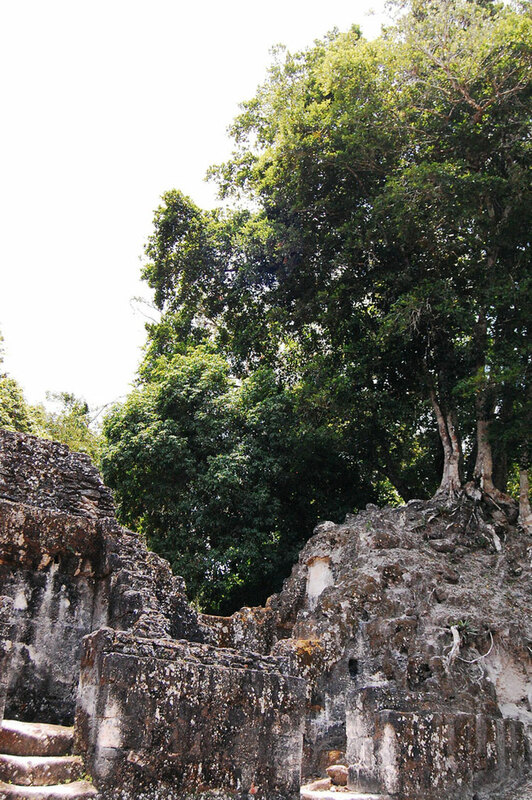 See this page for our Guatemalan longlist; ruins that didnt quite make our overall shortlist. These walks can be tough; through rainforest, in hot sun and intense humidity. Come prepared. Just like Mexico, Guatemala is home to site after site, palace after palace, and temple after temple, each telling an oft-times gory tale of human sacrifice and vengeful gods. The Mayan Empire, that built wondrous and widespread cities and cultivated violence, eventually fell to either Spanish machinations or its own bloodlust. 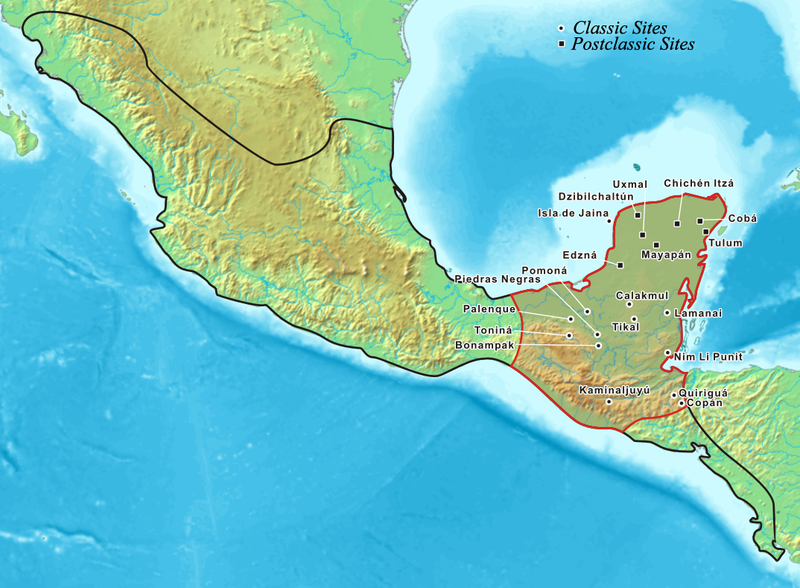 While perhaps thirty or so sites throughout Central America stand out as the deposed nations great civic fulcrums, there are in fact hundreds of archaeologically significant sites, and indeed thousands of smaller ones, across Mexico, Guatemala, Belize and Honduras. Qumarkaj: One of the most powerful Mayan cities when the Spanish arrived in the 16th Century, Qumarkaj stands on a plateau surrounded by 100m ravines. Structures include: the jaguar temple of Tohil, the temple of Awilix, the tem.ple of Jakawitz and the temple of Ququmatz, the Feathered Serpent. A main ballcourt divides a plaza between the palaces of two principal noble houses; other palaces (nimja) spread throughout the city, around a number of raised gladiatorial platforms. Dos Pilas: Declared a National Monument in 1970, set amongst forested ridges, low-lying wetlands, lakes and rivers. The site is laid out around a central plaza, with a 20m pyramid (with 18 hieroglyphic steps), vaulted crypts, a ruined palace, collapsed fortifications and ballcourt. 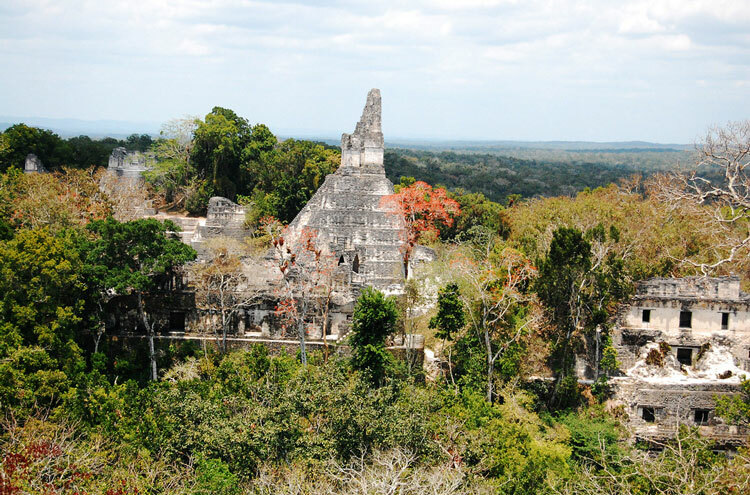 Extensive ruins radiate out for up to a kilometre, and over 22 caves in the vicinity bear some legacy from the Maya. El Peru: Difficult to reach atop an escarpment in the Laguna del Tigre National Park, findings amidst its tombs and ruins have redefined parts of Mayan beliefs and culture. An 18m tall with entombed treasures; bloodletting paraphernalia; the Queens Tomb and the usual civic structures. San Bartolo: San Bartolo, northeast of Tikal, is famous for some incredible mural paintings and as yet undecipherable Mayan script. Also, an 85foot pyramid (Las Ventanas The Windows); the temple of Las Pinturas (The Paintings); an early royal tomb and complex; and a triadic pyramid complex constructed over 350 years, similar to Tikals North Acropolis and the H group in Uaxactun. Seibal: Built on cliffs 100m above the Paison river, Seibal somehow survived the Spanish-wrought devastation of the Mayan civilization. Tropical rainforest covers much of this limestone plain, finding Seibal 27km east of Dos Pilas (see above). Three principal hilltop groups: parapets line adjoining causeways; a concealed fortress refuge above the river frontage; plazas, acropolis and temples. Two platforms, one square and one circular, have been restored. A satellite site to the north (El Alonel) features large structures built from clay dating from the Middle Preclassic Period. Quirigua: A linear, 3km-long site along the banks of the Motagua river, 48km north of Copan [link]. Its hard red sandstone allowed the sculpting of the tallest free-standing monuments in the Americas. In 738CE, Kak Tiliw Chan Yopaat effected a redesign of its centre in the image of Copan: a ceremonial area including three plazas (one, the largest in the entire Maya region), an acropolis, palace, ballcourt and hundreds of stelae and monuments. El Baul: Situated 550m above sea level, at the foot of the still-active Fuego volcano. El Bauls Acropolis was destroyed in 1997, and some of its structures subsumed by locals sugar cane fields; but there remains a ballcourt, two causeways and several residential groups of buildings and monuments to gawp at. For the ruins that did make the list, and for practical information applicable here, see our Mayan Ruins overview page.